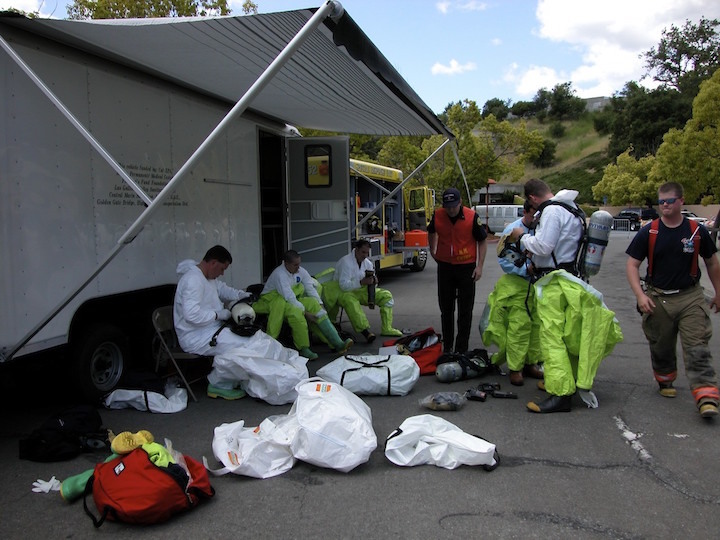 The Haz Mat Team operating at a MAD (Mutual Aid Drill) in 2003 at the Marin County Civic Center. This training event was organized and hosted by the Marin Sonoma Fire Training Officers. Photo courtesy Tom Forster. I will start with the Haz Mat Countywide unit. There was a Haz Mat incident, I don't remember if it was in Marin or not, but think it was in Marin. The Board of Supervisor were especially concerned that the County didn't have a haz mat response capability and provided $14,000 to begin initiation of providing that resource. San Rafael FD was the lead agency, and, using an old Terra Linda Fire Department engine chassis, purchased a box for the unit and through the goodwill of the Golden Gate Bridge District had the unit painted in their shop. The MCFCA then created a Joint Powers Agreement where each department paid an amount equal to their department's population. The JPA was solely with the FD, not the City or Fire District. It was determined by the Chiefs, that this would keep politics out of the JPA and since the amount was small could be handled within their existing budgets. San Rafael was the lead agency and also paid into the fund. San Rafael provided the financial accounting for the budget. The budget was no more than the $14,000 a year. In addition to some minor grants and the generosity of the Chevron Refinery, we received equipment for the unit. There were some Chiefs who believed their department would have minimal use of the unit, and didn't want to pay a large amount for a haz mat response. The $14,000 was the budget for a number of years, and finally the Chiefs Association consented to a larger budget. I don't remember what the exact amount was, but it wasn't much above the original budget. At the same time a Haz Mat Team was organized, members who were comprised of firefighters from different fire departments Marin, with monthly training. (Regionalization) Eventually through a grant, I believe Forrest Craig wrote, we received a new Haz Mat unit. SRFD's Division Chief Mike Angeli became an active member, and eventually assumed responsibility for managing the team. Forrest also had a great role in managing the team. We also had a verbal agreement with Richmond Fire and the Chevron Refinery to respond mutual aid into Marin. Both of these agencies preferred the verbal agreement as it was simpler. The real truth was that Richmond Fire was upset that the Chevron was supporting Marin's unit and providing some supplies, equipment and training, and believed they were being short changed. Never the less both departments were available to respond and I had the assurance of both Chiefs that any difference between Chevron and Richmond was not going to affect response into Marin. We also had a verbal agreement with the Coast Guard Pacific Coast Strike Team at Hamilton that they would respond. That was a little bit trickier, because the Strike Team had a federal mandate which didn't include local response, especially if it didn't include a waterway. The Coast Guard assumed some risk in responding, if the request didn't come from the federal government, but they wanted to be good neighbors. In 1994, The Marin County HMRT JPA (actually SRFD) applied for and received $80k from Cal EPA Region II as partial funding of an International truck and Wells Cargo Trailer. An additional $50k was raised through the contributions of: Golden Gate Transit District; Central Marin Sanitation Agency; Marin Sanitary; and Fireman's Fund. I wrote this grant only after my term expired as the Chemical Emergency Planning Commission Representative for OES Region II (so as not to infer any conflict of interest). This unit and "tow along concept" was replaced in 2007 with a new Spartan HMRT Engine obtained through a $300k UASI (DHS) grant via the County of Marin OES Office who managed the UASI grant distributions. In 2009 the Engine and Marin County TEAM was "typed" by Cal EMA as a Type II Haz Mat Response Resource - in accordance with the Fire Scope typing of apparatus. Between 2004 and 2005, Interim Chief John Montenero of San Rafael Fire wanted to divest their organizations management responsibiliity of the County HMRT. Novato Fire District was approached and asked to manage the team. I took on the assignment as the Novato representative and recrafted and updated the JPA which was adopted by the Marin County Fire Chief's Association. Although the original agreement was signed by all of the participating cities and townships, legal counsel Gary Ragghianti LLP, verified and validated that only the MCFCA needed to approve the "revision" because of an editing clause within the original agreement. After the retirement of San Rafael Division Chief Michael Angeli in 2004, I "volunteered" to take over the position of Ops Chief for the MCHMRT. Following the organizational structure of the MC USAR team, I developed team members to take on Logistics and Training leadership roles intended to build succession management (planning) and depth into the team membership. Retired Chief Angeli was retained as a "consultant" to assist in the weekly and monthly equipment checks and monitor calibrations that needed to be performed in additiona to being a valued technical expert. In 2008 I enrolled Battalion Chief Peter Davis from Corte Madera FD to eventually take on the Ops Chief role through a transition plan until my retirement August 2009. More on MCHMRT's role in the Regional Haz Mat Response Organization to follow.